Ronald Long is the Director Elder Client Initiatives with the WIM Control Group – Wells Fargo Advisors. He received the Barbara McGinity Service to Seniors Award in 2017 for excellence in elder financial protection from the National Institute on Financial Exploitation (NIEFE), an arm of the National Adult Protective Services Association (NAPSA). Prior to joining Wells Fargo, Long worked at the U.S. Securities Exchange Commission, where he served in various roles including district administration. The 2019 John B. Anderson Visiting Chair in Public Interest Law at the NSU Shepard Broad College of Law is Ronald C. Long. 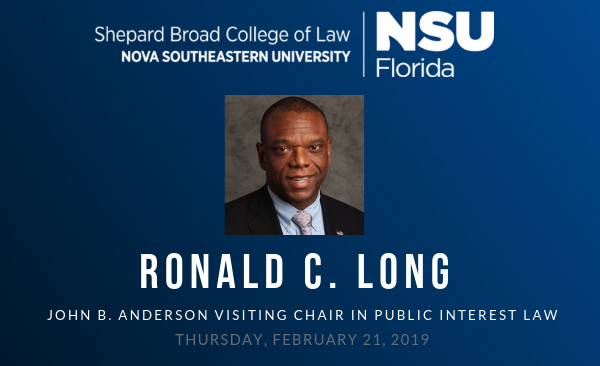 With the generosity of the C. William Trout Charitable Trust, the John B. Anderson Visiting Chair in Public Interest Law allows the Shepard Broad College of Law to expand its teachings, projects, and research in the field of public interest law. This is a free event.